2001 無限世界 Sidney Davidson 單集："Davidson's Eyes"
2004 實際一點 Danny Wood 單集："First Love"
^ Southern, Nathan. Dominic Cooper. All Media Guide / Rovi via The New York Times. [2014-05-10]. ^ Dominic Cooper leaves Mamma Mia! far behind to play Saddam's son. The Guardian. 2014-03-13 [2014-05-09]. ^ Fowler, Matt. 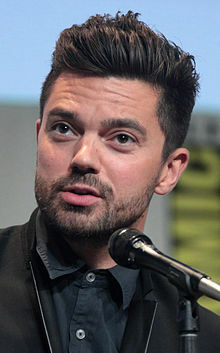 Preacher: Dominic Cooper is Jesse Custer. IGN. April 17, 2015 [September 10, 2015]. ^ Mottram, James. Interview: Dominic Cooper - 'I nearly broke Ronnie Wood's shoulder'. The Independent. 2013-10-14 [2014-05-09]. ^ Notaro, Vicki. How Oscar-tipped Ruth Negga's star has finally ascended.... Irish Independent. 23 May 2016 [23 May 2016]. ^ McBride, Caitlin. Irish actress Ruth Negga and Dominic Cooper make rare public appearance at Warcraft premiere. Irish Independent. 8 June 2016 [9 June 2016].